LOCATION.--Lat 40`58'28", long 76`48'00", Northumberland County, Hydrologic Unit, 02050206, on left downstream end of bridge on Shakespeare Road (SR 1025), 1.5 mi south of Potts Grove, 5.5 mi upstream from mouth. PERIOD OF RECORD.--January 2013 to current year. GAGE.--Water-stage recorder and crest-stage gage. Datum of gage is 439.1 ft above North American Vertical Datum of 1988. Satellite telemetry at station. COOPERATION.--Station established and maintained by the U.S. Geological Survey in cooperation with the U.S. Environmental Protection Agency. 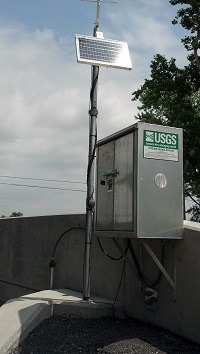 Supplied by USGS: Maximum recordable gage height (stage sensor operational limit) 36.6 ft.